The Gospel of John, with a cover designed especially for use by emergency services personnel such as police officers, fire department, paramedics and nurses. Many police officers and others in this world of broken lives share the Gospel of Jesus Christ, and this cover resonates with the simplicity of presenting the Truth of salvation through faith in Christ. 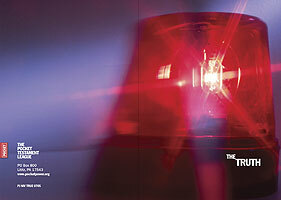 A simple red code 3 emergency light sets the tone for a simple title: "The Truth." Inside this Gospel is the basic truth that can help anyone weather the storms of a broken life through faith in Christ. Shown is the front and back cover spread.